Just what you need to get your outdoor tap mounted on the wall. 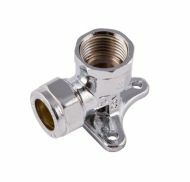 Compression plumbing fittings do not require heat or solder. They can be used with copper or plastic pipe and are suitable for hot and cold systems. 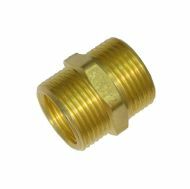 Brass 15mm compression equal tee fitting. They can be used on wet pipework, and are suitable for hot and cold systems. Brass 15mm double check valve with two internal non return spring valve mechanisms. This double check valve is a backflow prevention device designed to protect water supplies from contamination. It is often a local authority requirement in plumbing installations. 3/4 inch x 1/2 inch BSP brass reducing hex bush. Outside bib-tap wall mounting plate, suits 15mm copper and plastic pipe, 1/2 inch BSP female thread. Chromed on brass - not mirror chrome. Pack of screws, plugs and a roll of PTFE tape. Just what you need to fit an outdoor tap. Brass wall plate flange with 360mm long copper pipe (15mm outside diameter), female 1/2 inch BSP thread to suit standard outside tap. Makes a really neat job of an outside tap installation. 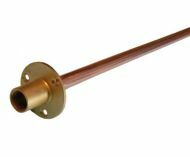 Brass wall plate flange with 600mm long copper pipe (15mm outside diameter), female 1/2 inch BSP thread to suit standard outside tap. Makes a neat job of an outside tap installation. This item is only available to UK customers, it's too long for an airmail package. 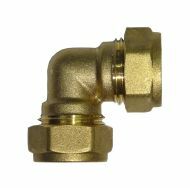 Brass outside bib-tap wall mounting plate, 15mm compression connection suits copper and plastic pipe, 1/2 inch female BSP threaded tap connection. Outside tap wall mounting plate, suits 22mm copper and plastic pipe. Used to wall mount a larger (3/4 inch) outside bib-tap. 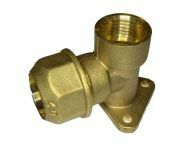 Outside bib-tap wall mounting tee plate, 15mm compression connections suits copper and plastic pipe, 1/2 inch female BSP threaded tap connection. 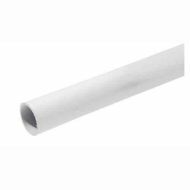 400mm long piece of 20mm (outside diameter) plastic electrical conduit. Makes a great wall liner for 15mm copper pipe in an outside tap installation. 15mm copper pipe, approx 380mm long (more than enough for a standard cavity wall), supplied with elbow already soldered.